Waiting is hard. We, who have watched for the birth of the Messiah, who have walked through Advent, who have waited for Christmas, who have waited until the end of Christmas dinner for the opening of Christmas presents, know something about waiting. Waiting in expectation is a difficult business. On this 7th day of Christmas, we can relate having waited. We might also wonder if we got exactly what we were waiting for (and I do not mean, just a hatchimal or the particular electronic that you were hoping for). On the strength of this Christmas season, let us look through the eyes of Simeon. Simeon has been living in expectation for years. We are not told how, but it has been revealed to him that he will know the Lord’s Messiah, before he dies. Now, as a devout Jew, Simeon, who is regularly in the Temple, knows it has been a long time since God has been talking to God’s people. God has talked to God’s people before. It is just recently, like the last 400 or so years, not a lot of communication, it seems between God and God’s people. But Simeon is expecting God to show up. And like you and I do, Simeon says his prayers and does his devotions, pauses in the Temple, takes walks in the quiet places, talks to the sages, listens to the wise ones, pauses in the silence, and generally waits on God. And then, the moment. Simeon is guided by the Spirit to be present in the Temple. As subtle as that. No sky writer. No 6pm evening news. No live announcement. Simeon is guided by the Spirit to present in the Temple. And Simeon follows the Spirit. Let me pause for a moment to give us some chronological footing. 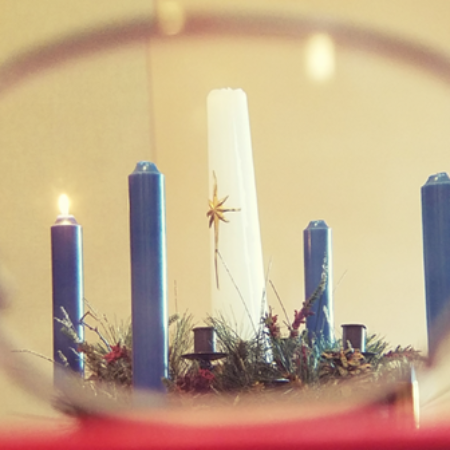 In the liturgical year, we like to imagine that everything occurs in a single year. However, necessarily the life of Jesus takes place across approximately 33 years and we tell the stories across a single liturgical year. While we read this passage in the lectionary between Christmas and New Year’s, the Jewish law indicated that forty days after birth of a son (eighty for a daughter) the couple would offer the ritual sacrifice of two turtle doves at the Temple. This is where Simeon met Mary, Joseph, and the 5-week-old, infant Jesus. As Simeon discerns Jesus as Messiah from among other infants in the Temple that day, he takes the child in his arms and offers incredible blessings to himself, Jesus, Mary, Joseph, Israel, and the world. Nunc dimittis. Now you are dismissing your servant in peace. God kept God’s promise to Simeon. And God speaks through Simeon to Mary and Joseph, to those gathered and to that larger community of faith. Challenge and blessing will not be far from one another. Light of revelation and sword to pierce your soul. What puzzlement to the parents of a five-week-old infant who probably were not even sleeping three hours at a stretch yet. Simeon gave his life expectantly waiting and watching for the Messiah as God kept God’s promises. He followed the leading of the Holy Spirit. He waited on the redemption of God. Redemption does not mean that we have solved how exactly others will encounter the challenges of the world. Redemption does not even mean that we are content with how God will work it out. Redemption mean that we are willing to offer our circumstances fully to God (not take them back) and wait to see how God will make more out of where we have been, than where we are currently. One week a Sunday school teacher had just finished telling her class the Christmas story. After telling the story the teacher asked, “Who do you think the most important woman in the Bible is?” It is always dangerous to ask these questions, you never know what answer you might get. On this New Year’s Eve, it is not just good riddance to bad rubbish. On the strength of the patience of Simeon, we speak words of blessings for 2017 and look forward to 2018. Blessing is not just about whitewashing and forgetting. Blessing is about letting God use and redeem the remnants of every experience to teach us about the future. May you who are in the long season waiting, wait as Simeon, on the Holy Spirit. May you who are in the season of redemption, look for where God is moving in the challenging situations of your life for redemption. Blessings on the year to come. But when the fullness of time had come, God sent his Son, born of a woman, born under the law, in order to redeem those who were under the law, so that we might receive adoption as children. And because you are children, God has sent the Spirit of his Son into our hearts, crying, “Abba!] Father!” So you are no longer a slave but a child, and if a child then also an heir, through God. Sunday: “But when the fullness of time had come, God sent his Son, born of a woman, born under the law, in order to redeem those who were under the law, so that we might receive adoption as children.” Galatians 4: 4-5. Jesus was not only a sweet baby child; Jesus is God incarnate. Jesus is God; and Jesus is God’s son. Jesus is the reason we are fully reconciled with God and received into God’s family. Give thanks for Jesus. Monday: “And because you are children, God has sent the Spirit of his Son into our hearts, crying, ‘Abba! Father!” Galatians 4: 6. When we turn to God as parent, we seek the familiarity of one who always has our best interest and loves us without condition. Where in this New Year are you turning to God as Parent? Wednesday: “It had been revealed to him by the Holy Spirit that he would not see death before he had seen the Lord’s Messiah. Guided by the Spirit, Simeon came into the temple; and when the parents brought in the child Jesus, to do for him what was customary under the law.” Luke 2: 26-27. The movement of the Holy Spirit often amazes and befuddles us. Look around for God’s movement. Thursday: “Master, now you are dismissing your servant in peace, according to your word;” Luke 2: 29. Simeon waited his whole life for the promise of God to be realized. How long will you wait on the Lord? a light for revelation to the Gentiles and for glory to your people Israel.” Luke 2: 30-32. Simeon is rewarded in waiting with a broadness of vision and widening of how he understood God. Simeon knew God as God of Israel and came to know that God also came for the Gentiles as well. Where is God widening your vision? Saturday: “Then Simeon blessed them and said to his mother Mary, ‘This child is destined for the falling and the rising of many in Israel, and to be a sign that will be opposed so that the inner thoughts of many will be revealed—and a sword will pierce your own soul too.’” Luke 2: 34-35. Blessings are not without challenges; joy is not without sorrow. Pray to know God’s presence and blessing in the year to come.